Who doesnt like antique showpiece for their homes? But yet getting authentic antique items for your homes are going to cause a huge hole in your wallet 🙁 Does that mean you cannot have one? You can always DIY as long as you are ready to read through the rest of this tutorial. 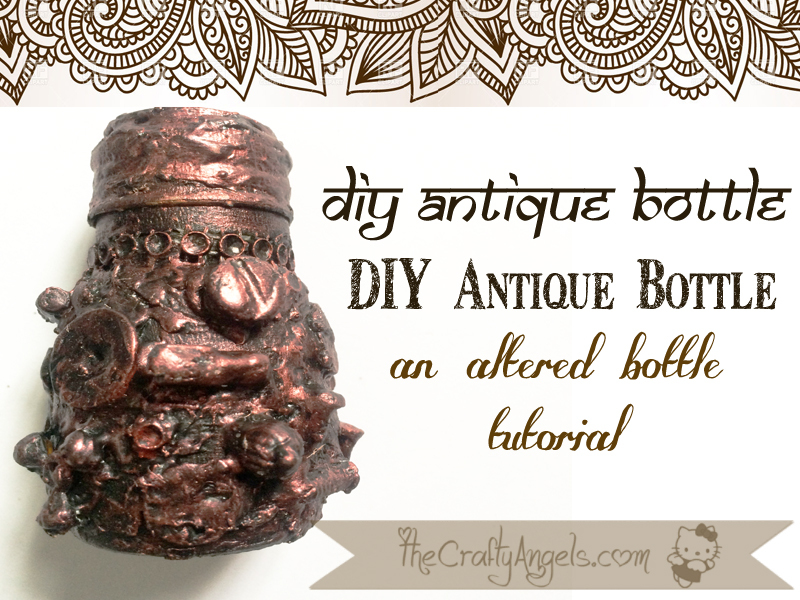 Presenting to you is DIY Antique bottle tutorial by using mixed media alteration technique. As you might have seen from my recent post, you should be getting that stamping bug has bit me 😛 I’m buying stamps and inks like crazy and trying out various techniques. I think the various craft challenges hosted by many Indian blog ( as listed HERE) really helps in being consistent and also trying new stuffs. So I made this black and white CAS card using generation stamping technique for Kraftzone challenge for June 2015. I tried holding the iron very close to the paper but it did not melt the embossing powder. I tried my hair dryer but it blew off all the powder haha! So lastly I tried with cigarette lighter 😛 Held it very close ( blue flame ) and moved it quickly mimicking the outline of the sentiments as soon as one area was melted. What is Generation Stamping Technique ? Generation stamping is a technique wherein a single ink is used to create different shaded images by stamping it multiple times without re-inking. What you need to do in this technique is to ink your stamp well and stamp once to get your first generation image, without reinking, stamp again for your second generation image and so on. It really depends on the ink whether you can go for third and fourth generation images or not. Here is a blog post from Catchy Designs (HERE) where Deepti has made this beautiful hearts card using generation stamping technique. You can see from the above videos how different shades/colors can be achieved through generation stamping technique even if you do not have many inkpads. To be frank, I wanted to try generation stamping technique but what I eventually achieved was something totally different because there was no different shades of images that I got! But anyways I wanted a black and white CAS card so I just let it be! I made this card with one layer over a no-card. The no card was cut out from normal white cardstock A2 size (5-1/2 x 4-1/4) and the layer was trimmed a little lesser than the no-card.I used Brustro drawing paper for the first layer where I have tried generation stamping technique. I used the small flower stamp from the set Cleardesign : Friends by Hero Arts with Rangers Archival black ink. I did three generations of stamping and I assume its obvious from the brightness/strength of the images. I tore the layer at about a little beyond half of its length with hand to create a torn effect and brushed the torn part with black soot distress ink. This layer was glued to the no-card with the help of tacky tape. For the sentiment, since I did not have a black cardstock in hand, I used a white one by covering it with black soot distress ink after embossing my sentiment. As I told you before, I did quite a lot of experiment to finally come out with this result although it isnt really a success! I used ” You are in my thoughts sentiment” from Hero Arts Cleardesign – Friends stampset and stamped it on white brustro drawing paper with versamark ink. I covered it with Rangers white embossing powder and used the blue flame of cigarette to set it. There were many stray particles here and there which I shouldve maybe avoided using an anti static pad ( which I dont have !). Here is the embossed result over which I used black soot distress ink. Here is a closer look of the embossing – The stray particle really created a havoc there plus the S in thoughts was not stamped properly I think or I brushed off the powder by mistake at the corner.Since I had already attempted this many times I just felt content with the outcome even though it wasn’t really perfect. See you soon with another card. Phew I need to take a break from paper crafting and try my hand on something else 😛 Hey yeah also we have Roshni Gupta joining us with tutorials soon. Keep watching this space for more new crafters and their tutorials! In case you are interested in contributing tutorials, please do go through the link HERE for submissions. If you are a regular reader of this blog, you wouldve already read THIS post on Quilling tools where I explained in detail about all quilling tools that are available. I own only a few of them viz slotted quilling needle, quilling board & quilling comb although I create quilled projects.